The Federal Government said it has uncovered a last-minute desperate plot by the Peoples Democratic Party (PDP) to orchestrate a crisis and trigger a sense of panic among the populace, in furtherance of their plan to discredit Saturday’s election and cause a constitutional crisis. In a statement issued in Abuja , the Minister of Information and Culture, Alhaji Lai Mohammed, said the plot confirms the alarm raised by the Federal Government on Jan. 21st and Feb. 3rd 2019 that the PDP is planning to scuttle the election and, where that fails, discredit it. ”As electioneering campaign winds down, the PDP has realised that it cannot possibly win a free, fair and credible polls. It has thus resorted to engaging in red herring, hauling insults and abuses at federal government and ruling party officials and making outlandish allegations with a view to creating a sense of panic and crisis. ”We are therefore calling on all Nigerians and the international community to disregard any attempt to scuttle or discredit the polls. We urge observers to keep an open mind. 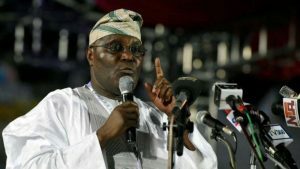 There is no cause for alarm, except in the warped imagination of the PDP, which has entered the panic mode and is already ruing the loss of another general election even before it has been held,” he said.